Manchester United are set to pursue West Ham midfielder Declan Rice. With Ole Gunnar Solskjaer now appointed as the full-time manager, the Red Devils are expected to completely alter their transfer policy. The club has resorted to spending big and bringing in established names since Sir Alex Ferguson’s retirement, but that method is about to change. As per the Independent, Solskjaer will go back to Sir Alex’s tried-and-tested method of recruiting promising young talent, which will enable him to build a team that grows together and remains a unit for the long term. The Mancunian giants have already identified the best young starlets to pursue in the Norwegian gaffer’s first summer transfer window. While Borussia Dortmund’s Jadon Sancho is believed to be the prime attacking target, a midfield prospect has now been identified as well. 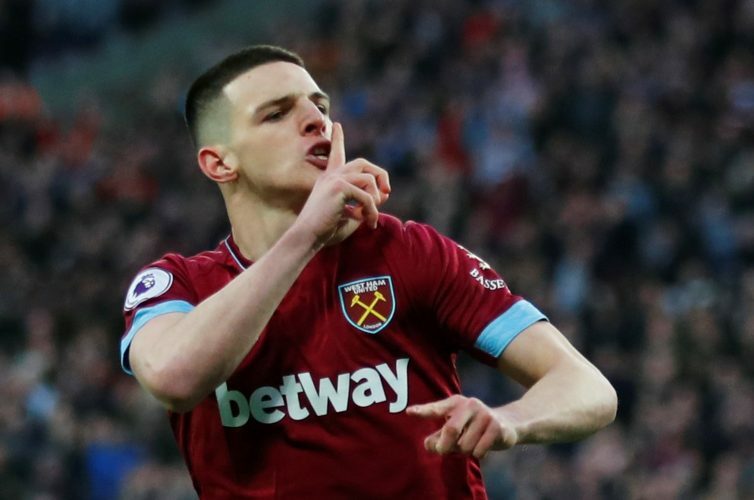 The report states that Manchester United are willing to go all out for West Ham United’s Declan Rice. The 20-year-old recently signed a new deal until 2024, but the Reds are expected to make an offer that will make his current £30,000-a-week salary look minuscule in comparison. The Hammers are likely to demand a fee in the region of £50m for the player, who only recently switched his international allegiances from the Republic of Ireland to England. Manager Manuel Pellegrini has already admitted that he will agree to sell the youth academy graduate if a “big team pays an important amount of money” for his services, meaning the player’s signature is there for the taking if Solskjaer is serious with his interest. Rice’s move to Old Trafford looks increasingly likely following the recent comments made by Rio Ferdinand about the 20-time English champions’ new transfer policy. The decorated centre-back stated: “What United used to do better than anyone else was identify the best young players out there and use the pulling power of the club to get those players in. “We had a young Pogba, a young Gerard Pique and players of that calibre at the club not so long ago, but the transfer policy has changed in the last few years and it has not always worked. “Big money transfers are good in some respects and the fans get excited, but Ole will want to work with young players and make sure they understand what it means to be a Manchester United player.